On Sunday I decided to do some scrapbooking just for me. Helen Onulak runs a scrapbooking challenge layout each week and the new one posted on Sunday was perfect for me to use. I did some switching around, but the layout is the same. I’m trying to use up my older paper and Life Delights was perfect for these photos of my daughter “nursing” her baby Rachel. I used Friendship Alphabet, but stamped them backwards, using the back of the stamp and then cut them out. I also used the Butterfly Kiss stamp set, retired slide frames sponged with Chocolate ink, Chocolate grosgrain ribbon and Chocolate and Lilac Mist brads. I printed the journaling on vellum so that the pattern on the paper would still show through. Maybe I’ll enter this layout in the Practical Scrappers Challenge. Click on the photos to see them larger and to read the journaling. It’s a fun story. This is a fantastic layout Krista!! The butterflies are great! You should definitely enter this in the Practical Scrappers challenge! Your LO is stunning! 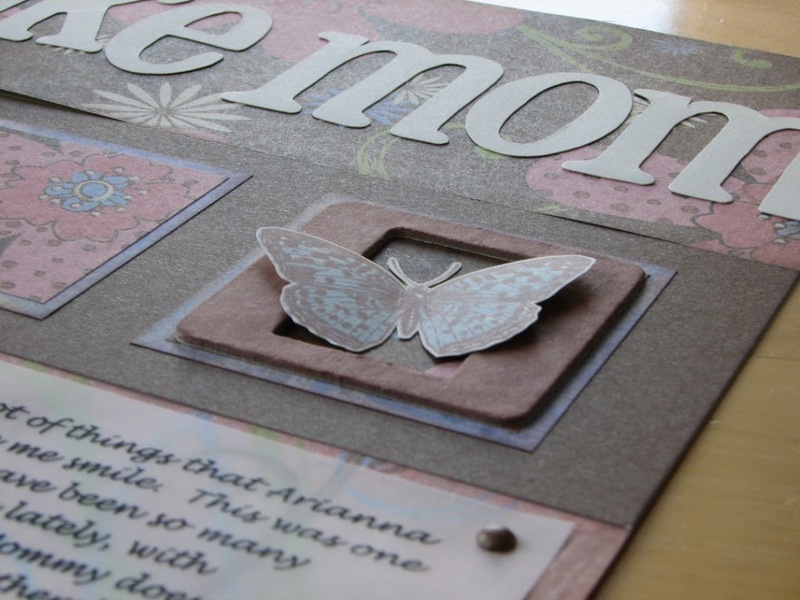 The little slide frames and butterflies are wonderful, and I love the addition of the journaling on vellum – so soft. What a beautiful layout! I love the Life Delights papers. Just BEautiful Krista! All the little details..just perfect. And the journaling..awwww she is sooo cute! This is gorgeous! Thanks for playing at PS! This LO is just BEAUTIFUL!! Thanks so much for joining us this week at PS!! Beautiful layout! My youngest daughter did the exact same thing….so sweet:-) Life delights paper is still my all time fave!! !